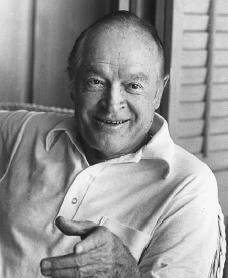 I n addition to his successes on radio, in movies, on television, and in live shows, Bob Hope entertained members of the American military all over the world and made many appearances to benefit different charities. Born in Eltham, England, on May 29, 1903, Leslie Townes Hope was one of Harry and Agnes Townes Hope's seven surviving boys. His father was a stonemason (a construction worker), and his mother had been a concert singer in Wales. By the age of four Hope was a skilled mimic and loved to sing and dance. In 1908 the family left England and settled in Cleveland, Ohio. For Hope, who looked and sounded British, the adjustment was difficult. Neighborhood kids turned his name around to create the nickname "Hopelessly." When he shortened his name to Les, they began to refer to him as "Hopeless." As a result of all this teasing, Hope often got in fights. He developed into a boxer of some skill. As a youth Hope sold two-cent newspapers on the streets of Cleveland to help his family out. On one occasion a man in a long, black limousine waited while Hope rushed into a nearby store to get change for a dime. When he returned he received a lecture about the importance of keeping change in order to take advantage of all business opportunities. The man in the limousine was John D. Rockefeller (1839–1937), founder of Standard Oil Company and one of the richest men in the world. As a teenager Hope once said that he would rather be an actor than hold an honest job. He performed whenever possible, mainly dancing and telling the one-line jokes for which he later became famous. He gained experience in an act he formed with a comedian from Columbus, Ohio, named George Byrne. Using the name Lester, Hope went with Byrne to New York City in 1926. They performed in cities and towns throughout the state. They finally appeared in a New York City vaudeville (traveling stage entertainment featuring several different performers) production called "Sidewalks." They were fired within a month, however. Hope got his first chance to work as a solo act at the Stratford Theatre in Chicago, Illinois, in 1928. He changed his name to Bob because he felt that would be "chummier" and would look better on a theater sign. Hope always made his audience feel at ease and comfortable by making himself the subject of his humor. He worked hard and succeeded but soon left the Stratford to tour Midwestern cities. From 1920 to 1937 Hope performed in all kinds of shows both on and off Broadway, earning a reputation as a master of the one-liner (a short joke). By 1932 Hope was earning a thousand dollars a week during a time when millions of people were out of work. Still, he was not satisfied. He always wanted to improve and to become an outstanding comic in the business. Hope met actor and singer Bing Crosby (1904–1977) in 1932, and they started performing together in song and dance routines. Hope met actress Delores Reade in 1933 and later married her. In 1935 Hope joined the "Ziegfield Follies" and performed in cities outside New York. In January 1936 he opened in the "Follies" at New York City's Winter Garden Theatre. The "Ziegfield Follies" was the musical highlight of Broadway, consisting of beautiful girls and costumes, witty dialogue between the actors and actresses, and music by such great composers as Vernon Duke (1903–1969) and Ira Gershwin (1896–1983). appear in fifty-two movies, including six films in the Road series (including The Road to Zanzibar and The Road to Rio ), which also featured Crosby and Dorothy Lamour (1914–1996). Hope has always been strongly patriotic. On December 7, 1941, when Japanese attack planes bombed Hawaii's Pearl Harbor, causing the United States to enter World War II (1939–45; a war in which Germany, Japan, and Italy fought against Great Britain, France, the Soviet Union, and the United States), Hope spoke out against the attack. During a radio broadcast on December 16, Hope declared his love for his country: "There is no need to tell a nation to keep smiling when it's never stopped. It is that ability to laugh the makes us the great people that we are … Americans!" In 1942 Hope was asked to make an entertainment tour of Alaskan army bases. Hope brought other performers along and put together a variety show for the troops stationed there. That was the beginning of a commitment on Hope's part that has never ended. Every year, especially during the Christmas season, he has led a drive to present shows to American men and women in the armed forces. At the Academy Awards in February 1941, Hope was given a special award for his many benefit performances. He also won honorary (awarded without meeting the usual requirements) Oscars in 1940, 1944, 1952, and 1965. Some of Hope's charitable activities involve golf. Hope has played the game all of his life, including with several U.S. presidents. In 1964 he agreed to have the Palm Springs Classic golf tournament renamed The Bob Hope Desert Classic, which he has hosted ever since. Since the administration of Franklin Roosevelt (1882–1945), Hope has appeared many times at the White House. Hope's seventy-fifth birthday party, held in the Washington Kennedy Center, was attended by members of Congress and by many of Hope's acting friends. Another celebration was held at the Kennedy Center in 1983, when Hope turned eighty years old. This time President Ronald Reagan (1911–) and his wife, Nancy (1921–), hosted the celebration. At the celebration Hope showed no signs of slowing down. In May 1993 NBC celebrated Hope's ninetieth birthday with the three-hour special "Bob Hope: The First Ninety Years." The show featured tributes from every living U.S. president at that time. By then, according to TV Guide, Hope had made more than five hundred TV shows and seventy movies. Hope concluded his sixty-year contract with NBC in November 1996, when his final special, "Laughing with the Presidents," aired. The Guinness Book of World Records called Hope the most honored entertainer in the world. By mid-1995 he had received more than two thousand awards, including fifty-four honorary doctorate degrees, The Saturday Evening Post reported. In 1998 Hope and his wife Delores announced that they would donate his personal papers and collection of almost 90,000 jokes to the Library of Congress. In June 2000 Hope spent six days in the hospital because of internal bleeding. Curtis, Jenny. Bob Hope. New York: Metro Books, 1999. Faith, William Robert. Bob Hope: A Life in Comedy. New York: Putnam, 1982. Grudens, Richard. The Spirit of Bob Hope. Stony Brook, NY: Celebrity Profiles Publishing, 2002. Quirk, Lawrence J. Bob Hope: The Road Well-Traveled. New York: Applause, 1998.